TBG > Blog > Which are current styles in Indian groom wear for wedding in 2019? Any less than perfect for the groom is not acceptable. If you think that the bride takes a larger share of crowd attention, then you are wrong! Because a groom is the one who shines on top of the ghodi. All the eyes in the wedding will be following both the groom and the bride so, be choosy and conscious in choosing your wedding outfit. 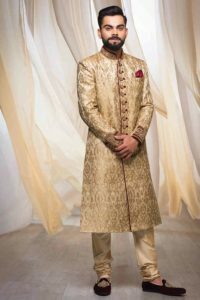 If you are unaware of the latest trends then continue reading this article to know about the current styles in Indian groom wear. When we talk about Indian weddings, the first dressing option that comes in our mind is the pathani coat. This Indian style of groom dress for a wedding reception gives an ample and stylish look to your outfit. Pathani coat is well known for its aura of dominance and bold designs. Lighter shades like silver, gold goes well for the reception and will give you an aesthetic look on your special day. Jodhpuri suits carry both Indian tradition and western classy look in it. This outfit goes well for a wedding reception look. When compared to all the other groom wedding suits in India, Jodhpuri suit is the most preferred outfit by many grooms. 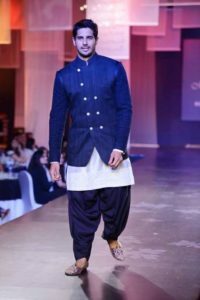 This is because the outfit is styled with colorful designs with the embroidered coat and trews will be the best wedding wear for grooms of India. You can complement this outfit with traditional shoes and add embroidered. If you are the one who likes to look weird and stand unique from the crowd then this style of Indo western look. Long knee length traditional kurta with different styles of trousers will give you a stunning and classy look. You can enhance this outfit by contrast sleeve colors, designer patiyala pants. Try out this different Indo western look for your wedding reception look. The Love for sherwani never dies! No wedding outfit can be replaced by this traditional sherwani attire. Though the culture and origin of this outfit are controversial, who minds of it. It is always about the look and comfort matters in an outfit. There are different categories and variety of styles in a sherwani. You can choose the intricate design and embroidery of the suit as per your wish and can complement it with heavy headgear and footwears like jutis. Add this style to your wedding shopping cart! Tuxedos will never go out of fashion, this style of groom suits for the wedding has not replaced by other outfits. If you are the one who wants to look classy and elegant on your own way then you can go with tuxedo outfit. I assure that tuxedo suits will give you a perfect wedding look and set to rock on your wedding reception. Keep note that the tuxedo color shade matches well your bride’s attire to retain the couple goals on stage. The style of wearing Dhoti has changed over the years. It is not only about the following tradition but it also considered to be one of the most classic attire for the wedding outfit. With the innovations in fashion genre, you can design and style your attire on your choice. You can match it up with a knee-length kurta or shirt. With will give you a different and classy look on the whole. Keep this style of wedding outfit on your list while shopping. Kurta salwar is one of the age-old traditional Indian outfits which still stands on the top and preferred by most of the groom even today. You can feel both classy and comfortable feeling in this outfit. As this style of Indian groom wear goes well for all kinds of footwear, you can choose either sandals or shoes of your wish. Embroidered silk kurta and contrasting salwar is the best combo of salwar kurta for the groom wedding outfit. Other than this, there are many patterns and styles for this salwar kurta outfit, you can opt for the one that best suits your personality and enhance your beauty on your special wedding day. These are the some of the eye catchy and current styles for Indian groom wear. Pick out the one style from the above outfits and try it on with your own designs and styling.